Start your road trip soaking up the sun in Brisbane, a city that boasts spectacular beaches as well as eclectic art and cultural scene. Brisbane has something for every traveller. Start your morning with a stroll on one of the sun-soaked beaches – sip on a coffee and take in the spectacular scenery. Not sure where to start? Try Broadbeach, Kirra, and Main Beach. For lunch, wander through South Bank to discover a plethora of entertainment, museums, boutiques, restaurants and bars. If you’re visiting on a weekend, be sure to check out the local farmers markets – you’re guaranteed to find something that catches your eye. After a long day of exploring there’s nothing better than relaxing with fabulous food and wine. Places such as 1889 Enoteca, Bird's Nest Yakitori, Harveys Bar + Bistro, Malt Dining, and Stokehouse Q are great for a bite to eat and drink. There’s certainly no shortage of award-winning restaurants and trendy bars to choose from in Brissie. Escape the hustle and bustle of Brisbane and drive one hour and twenty minutes to Buderim Forest Park. Here, you’ll find a tranquil escape under blankets of green, lush forest. Discover cascading waterfalls, the striking rainforest ambiance and an abundance of wildlife. Be sure to pack your bathers – we guarantee you’ll want to stop and have a swim in Serenity Falls. Don’t be surprised if you recognise Serenity Falls – Decore shampoo shot their famous commercial under the waterfall. If you want to stay the night for a rejuvenating retreat, Coochin Creek camping area is just a 25-minute drive south of Buderim. If 5-star accommodation is more your thing, there are a number of B&Bs available such as Arabella Guesthouse, and Amore on Buderim Luxury Rainforest Cabins. Next stop is Mooloolah River National Park, a short 25-minute drive from Buderim Forest. This is a great place to stop off and explore the many walking trails available. Choose between winding your way along the river or traipsing through the rainforest. Stay until dusk for your chance to see a platypus. For sunny skies and stunning coastal beaches, Noosa doesn’t disappoint. 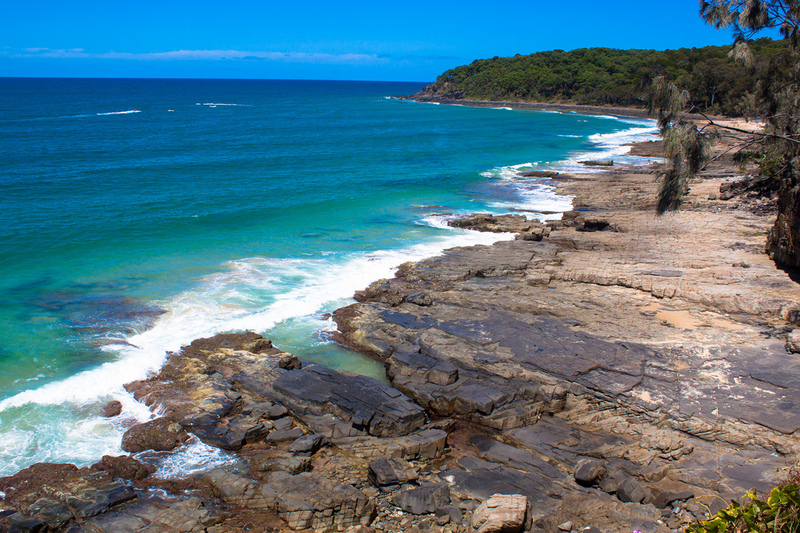 Make your first stop Noosa National Park which is known for scenic walks, hikes, and fabulous hidden beaches. Take your rental car, drive down the coastline, and you’ll discover a beach-goers paradise. If surfing tickles your fancy, head to one of the many surf spots Noosa has on offer, such as First Point or Little Cove. There you’ll find world-class swell ready and waiting. If surfing isn’t your thing, give stand up paddle boarding a go – take a class with an instructor to perfect your skills. End your night at Laguna Lookout Walk and watch the sunset. Once you’ve watched the spectacular colours on the horizon, try one of the many bars on offer such as Bordertown, Paradise Arcade, or Locale. The trip from Gold Coast to Noosa provides a great balance between the hustle and bustle of Brisbane’s inner city and the tranquillity of the rainforests, national parks and beaches. This road trip ticks all the boxes.